Cliff Claggett was born to James and Annie Claggett on December 19, 1908 in Melfort, Saskatchewan. His father was a successful farmer and rancher, and young Claggett grew up with a love and appreciation of livestock, the strong values of commitment and hard work that comes from country life, and an ambition that was second to none.He married Swedish immigrant Matilda Rislund on Feb. 2, 1929. They lived in the Melfort area, and later moved to Carrot River, Sask., in 1944 and then to Metiskow, Alta., in 1947. Claggett established himself in a number of successful ventures in the agriculture, automobile and timber industries. The Claggetts raised six sons — Emmett (Buster), James, George, Dale, Ed, Dennis and one daughter, Faye. The youngsters grew up with a love of rodeos and chuckwagon racing which would eventually become a main focus in their lives. Inspired by the Calgary Stampede, Claggett dreamed of a spring rodeo and chuckwagon racing circuit in northern Saskatchewan. In the spring of 1947, his dream became reality. 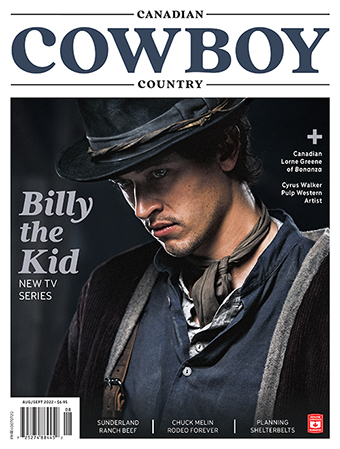 Financing the venture himself, he assembled many of the day’s top rodeo cowboys and chuckwagon drivers to stage exhibitions at five Saskatchewan communities. Each stop would begin with a parade down the main street. When the parade kicked off at the first stop in Saskatoon on May 24, 1947, the “Cliff Claggett Stampedes” were officially born. His barnstorming tour enjoyed a three-year run. Eventually, it branched out into Central Canada and the northeastern United States. But finances remained tight; revenue proved disappointing and his plans for another tour past 1949 were put on hold. That winter, Claggett started producing indoor rodeos and incorporated pony chuckwagon racing — a smaller version of the thoroughbred chuckwagons. It’s unclear whether or not pony chuckwagon racing was “invented” by the showman — but he was certainly one of the first, and is arguably the biggest influence, in the development of the sport. Cliff Claggett, from his chuckwagon seat, shakes hands with an admirer. In 1950, Cliff moved his family to Birch River, Man., and five years later to Clinton, B.C. Both moves allowed him to pursue opportunities in the timber industry. The success of these ventures gave Claggett the cash to revive his show. He added the pony chucks and headed out in 1953 on another tour which enjoyed a three-year run. Another tour that began in 1964 lasted two years. Not every stop was a rip-roaring success and the money — which was always tight — again ran out, halting his touring Wild West show. Claggett not only ran his businesses and organized his tours, he was also a successful chuckwagon driver and owner in his own right. He entered his first wagon at the Calgary Stampede in 1949 and his last in 1969. He drove until 1961 when Ralph Vigen took over the lines. As Cliff’s sons became more involved with the horses, the wagon canvas ran under their names. 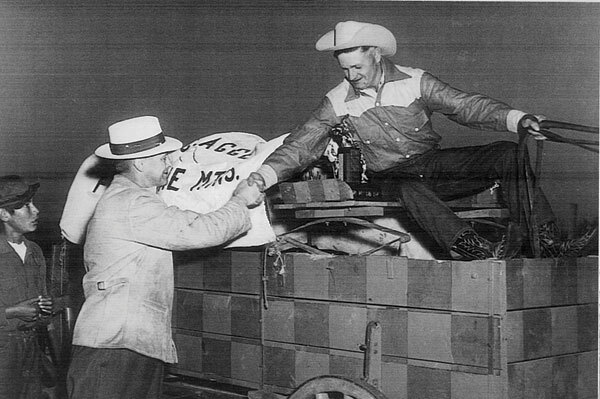 In 1963, Ralph Vigen captured his first World Chuckwagon Championship under the canvas of “Claggett Brothers” (for Dennis and Ed), and that same year Cliff debuted pony chuckwagon racing in the Houston Astrodome where they have raced annually ever since. 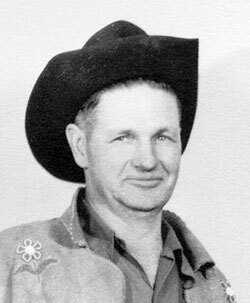 From 1967 to 1969, Claggett entered a chuckwagon under his own name at the Calgary Stampede with three different drivers handling the lines. On July 20, 1971, during a practice run at Morris, Man., Claggett was tossed out of his pony wagon. When he hit the ground, the driving lines had entangled his leg. To the horror of the onlookers, he was dragged down the track. On Sept. 17, 1971, almost two months to the day of his accident, Cliff Claggett succumbed to his injuries at the age of 63. It’s been nearly 40 years since his passing, but the legend of Cliff Claggett lives on. His son Ed is involved with Lafarge Canada Inc., who sponsors chuckwagon driver Troy Dorchester on the WPCA Dodge Pro Tour. His nephew-in-law, Dennis MacGillivray, produces the pony wagon races down in Texas. His great-nephew Layne MacGillivray drives big wagons on the WPCA Dodge Pro Tour. His grandson is recently retired five-time Canadian Tie Down Roping Champion,Cliff Williamson — who was named after his grandpa. The Big M Stampede in Morris, Man., and the Northwest Round-Up in Swan River, Man., were both founded by Claggett. A host of Canada’s top chuckwagon drivers and rodeo cowboys from the last half of the 20th century give Claggett credit as the man who gave them their start or had been the most influential over their careers. A truly extraordinary individual, Cliff Claggett may well have been the last of the great Western showmen. I used to manage the Texas Prison Rodeo in Huntsville and in I believe it was 1969 or 1970 I had Cliff bring his chuck-wagons and chariots to race for us. In 1978 I was out on the prairires of western Canada and ran into someone who had known Cliff and told me of his death. What a great guy and wonderful showman. I met Cliff and Allie Claggett when I was 12, at the Saskatoon Pioneer Days. Turns out they had known my parents in Nipawin, Saskatchewan. The following summer I was fortunate enough to travel with them for the summer throughout Manitoba. We traveled in a converted Greyhound diesel bus and I was given my own pony (Trigger) to ride whom I was lucky enough to ride in the parades. I had a wonderful summer and Cliff even taught me to drive a pony chariot. I will always cherish the time that I was able to spend with them.